No work of modern French composer Maurice Duruflé is better known than Requiem (1947), his setting of the Latin liturgical texts of the Missa pro defunctis, the “mass for the deceased.” On Saturday night, the audience at San Roque Catholic Church was blessed with a large-scale, electrifying performance of this 45-minute wonder by the Santa Barbara Choral Society, bolstered by the Westmont College Choir and area orchestral players. San Roque’s interior surfaces of stone and wood paneling are notable for their acoustical bounce — a bane for speech, but a sumptuous reverb for choral music. In a room that favors the sonic bright side, strings, too, are transformed and take on a celestial edge, which on Saturday allowed a distinct, but balanced, complement to the voices. With 120 voices and 25 orchestral players to lead, conductor JoAnne Wasserman made full use of the advantages of magnitude, especially in the dimension of dynamics. Although Requiem is cherished for its appeals to peace and comfort, it also breaks suddenly into climaxes of praise — as well as the alarms of the last judgment. While dozens of composers have set these liturgical texts, Duruflé’s version stands out for its literal borrowing of melodic themes from Gregorian chant. Primitive in the roll of its line, and simplified in harmonic structure (often based on the five-tone scale), chant calls to a core of quietude within us. The single most mesmerizing feature of this work, in nearly every movement, is the unison line floating above a steady undulation in organ or strings. As the movements develop, Duruflé brings old and new together, setting ancient melodies in modern harmonic matrices. He transposes and multiplies the lines, pouring them over one another in canon form. Solo baritone is featured in two movements, “Domine Jesu Christe” and the earth-shuddering “Libera Me.” Ralph Cato’s rich voice was ideal for this office, holding his own over the massive ensemble. One disappointing feature of this arrangement was the omission of solo soprano from the “Pie Jesu,” electing instead to have women in unison. This memorable plea of great fervor at the heart of the Requiem (the most well-known movement of the work) loses essential intimacy in ensemble. Happily, Wasserman chose to include the obligato cello solo, compensating in some measure for the absence of a solo voice. Cellist Jeanne Shumway played these lines with lyricism and sensitivity. 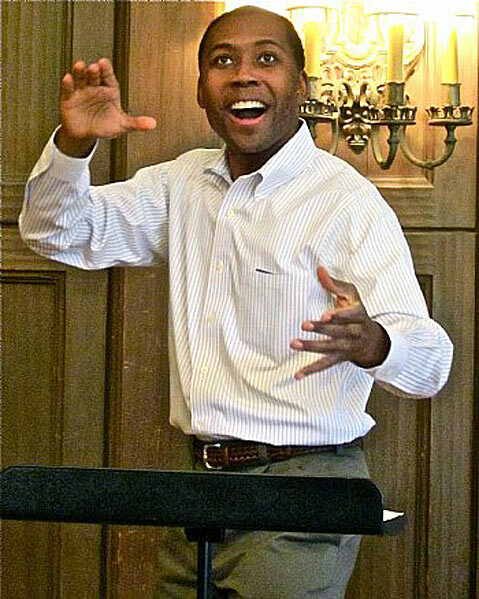 Composer Rollo Dilworth journeyed to Santa Barbara to conduct a workshop with the Choral Society in preparation for their performance of his <em>Rain Sequence</em>. The other major feature of this concert was the West Coast debut of Rollo Dilworth’s The Rain Sequence (2011). The young (and youthful) Dilworth held a workshop with the choir two weeks ago, impressing his energy and emblem upon the piece. The Rain Sequence is jazz and gospel based, comprising three movements. The first two, “In Time of Silver Rain” and “When Storms Arise,” are based on poetry by African-American writers Langston Hughes and Lawrence Dunbar, respectively; the final movement is an arrangement of the spiritual “Didn’t It Rain.” One condition of the commission (by the Mendelssohn Club of Philadelphia) was audience participation. The ambience thus shifted to informality as Wasserman taught the audience how it could collectively simulate the one thing Santa Barbara is not getting this season by tapping, patting, finger-snapping, and the rubbing of palms. They also learned to hold a hum of “Amazing Grace” against a complex countermelody sung by the chorus. Audition passed, the music began. The choir, especially the Westmont students, visibly reveled in the swing — their sways and smiles powered by the afterglow of their day with Dilworth (classical choirs typically shun such license). The audience hummed for grace while Westmont students lined the aisles lending support. Cato stepped forward as frontman for “Didn’t It Rain,” his voluminous presence disappearing for moments (the only imbalance the whole night) in torrents of sound — the spirited choir, the rattle of tambourine, the preaching trumpets. But such enthusiasm is the most forgivable of sins. The applause came down like rain.